The Agar installation brings together, in the same exhibition space, two cultures and an ecosystem. All three reveal the changes that certain microbes undergo. The cianobacteria cultures are displayed inside four covered aquariums on a table containing saline solution and white blotting paper as well as the bacteria. The fungi cultures can be seen inside six Petri dishes fixed to metacrylate frames on two wooden tables. The Petri dishes contain agar. The ecosystem consists of two glass cylinders full of organic mud and water. Known as Winogradsky columns they are illuminated twelve hours a day by incandescent light and they are also on a table. The procariotic and arqueas bacteria display an incredibly diverse metabolic system, even more so than animals, plants, fungi or any other organism. Procariot bacteria conserve and recycle all the mineral elements necessary for life. This type of column is called after its inventor Sergius Winogradsky (1856-1953). A video showing the sequential transformation of these microbes completes the installation. The Agar micro organisms are subjected to a strategy used in microbiology laboratories, whereby the conditions of artificial light and nutrition favour the transformation and development of the microbes during the time span of the exhibition. Unlike works of art that are presented to the spectator as closed objects, these installations have an open dimension and they are systems that enable us to observe short-lived processes. The real meaning of the Agar installation is revealed not so much in the solid objects but rather in the ephemeral communities of micro organisms that grow, reproduce and die. 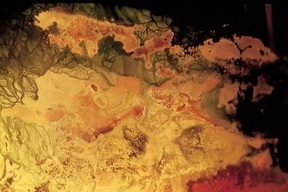 At one level, Agar could be seen as a live painting. Production: Begoña Egurbide, Marcel.lí Antúnez Roca. Production assistants: Patricia Bofill, Sandra Port.